I have now registered with photobucket to see the issues with posting images. Basically you need to get the URL (address) of your photobucket image. 1. Let us assume that you are posting a new thread or making a reply on this Discussion Board and want to insert an image. Let us also assume that you have already uploaded the image to photobucket. 2. You need to log in to photobucket and put the mouse over the required image. 3. A box giving link options should appear. The second is 'Direct Link. To the right of this is a textbox whose contents start 'http:...'. Left click to select this text. (It is the URL (address) of your image.) Now right click on the text and choose 'Copy' in the drop down menu. 4. Now go back to your posting on the Discussion Board and left click on the Insert/Edit Image icon. A pop up window will appear. 5. This window has a textbox titled 'URL'. Right click on this textbox and choose 'Paste'. 6. Click on 'OK' and the image will be inserted. Here is a Highfield cover that I have just posted from photobucket following these instructions. 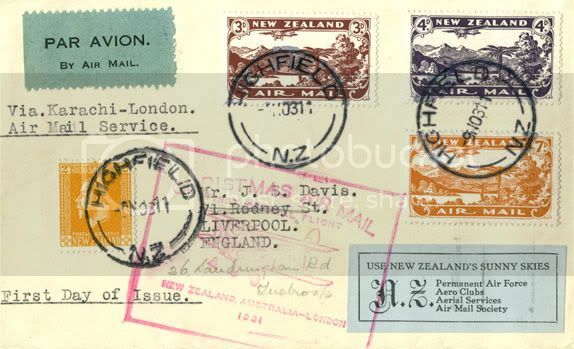 (Posted on 9 November 1931, the day before the stamps were issued.) I am very interested in seeing scans of other Highfield covers.